IT'S THE WORLD SERIES FOR THE 2014 CHICAGO MOB!! MOB FANS STORM TERRAPIN STATION AFTER THE GAME 6 VICTORY. For only the 3rd time in the franchises history, The Chicago Mob will play in the GUSSOMO world series. The Mob beat The Missouri Mustangs 4 games to 2 to advance then bested The Seattle Pilots by the same 4 to 2 margin. The Mob has not been to the GUSSOMO World Series since 1996 when they lost to Brad Stine's Santa Rosa Condors in 7 games after holding a 3 games to 1 lead and were 6 outs away from winning game 5. Chicago was also in the 1987 World Series vs. Ralph Polumbo's Stateline Superba's but lost 4 games to 1. We hope for better results in 2014. It started out poorly for Chicago as Missouri jumped all over James Shields in game 1 and Matt Scherzer was lights out for The Mustangs. Final was 9 - 4 Missouri. Chicago bounced back in game 2 behind Matt Harvey, who alllowed only 5 hits and 1 unearned run for the complete game victory. Jacoby Ellsbury was the hitting star, going 3 for 5 with 3 RBI. Moving to Chicago, The Mob pressed Yovani Gallardo into service and he responded going 6.2 innings, allowing only 1 run in the 6 - 1 Mob win. In game 5, James Shields bounced back, going the distance. Ellsbury again was the hitting star, going 3 for 4 with a home run and 2 stolen bases. Miguel Gonzalez hoped to wrap things up, and started well but Matt Scherzer was better and The Mustangs held on for a 5 - 3 win and sent the series back to Missouri. It didn't take long in game 6 as Chicago scored early and won 5 - 1. Series MVP honors went to Jacoby Ellsbury who went 7 for 19 with a HR and 5 RBI. Chicago had home field advantage and took it in game 1. Due to rest issues, Miguel Gonzalez was called to start game 1, and boy did he respond going 6 shutout innings, allowing only 4 hits with the Mob bullpen going 3 shutout innings. Ellsbury and Adam Lind had 2 hits apiece and each drove in a run in the 3 - 0 win over Zack Greinke. Matt Harvey started game 2 for Chicago and it looked good until Seattle rallied for runs in the 7th and 8th innings to take a 3 - 2 lead which they did not relinquish, sending the series to Seattle tied 1 - 1. Game 3 was an epic 13 inning affair, won by Chicago 7 - 5 when Seth Smith drilled a 2 run HR. Brett Oberholtzer pitched 3.2 innings of relief to earn the win. Game 4 was a 10 - 4 rout by Chicago with Oberholtzer again going 3 innings to get a save. Chicago could not put it away in game 5 as Seattle rallied with 2 runs in the 8th to win 4 - 3. Back to Terrapin Station where Matt Harvey was brilliant, tossing 8+ innings of shutout ball. The bullpen was shaky but with The Mob scoring 8 times, it was good enough and the celebration began. There were several candidates for series MVP. Smith, Oberholtzer, and Gonzalez had key roles. But the writers decided to go with Matt Harvey. He lost game 2, despite pitching well but was lights out in the deciding game 6, giving Seattle no chance. 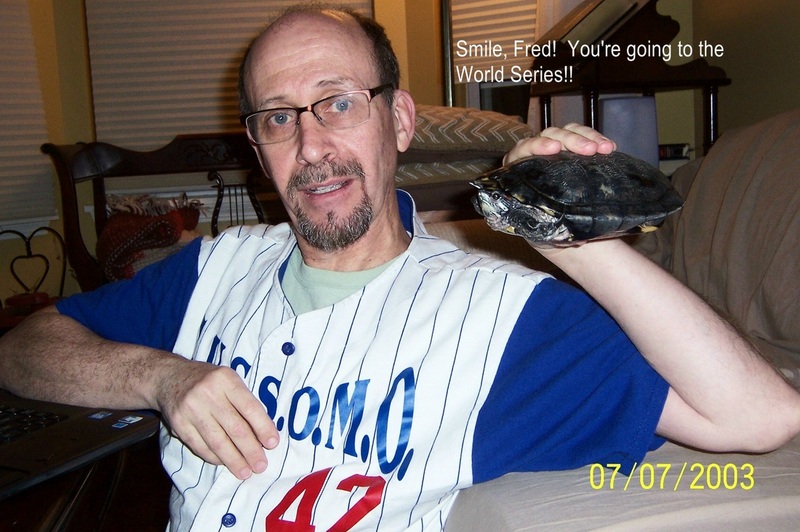 It also allows Fred to start James Shields in game 1 vs. Buster if he so desires. Chicago salutes both Missouri and Seattle for their fine seasons and good play off series'. Both series were evenly played with the away teams winning as many games as the home teams. We look forward to a great series vs. Andy Rosenberg and Busters Battalions. Fred has already started doing a bit of scouting.